Greentopia > Green Visions > Three cheers for Tiani Jennings, our Green Visions site manager! When Morgan Barry, manager of the Green Visions program, heard that Monroe County was looking for young people to recognize, he said it was a no-brainer to nominate Tiani Jennings. The 21-year-old manages our job development/garden site in the JOSANA neighborhood. She grew up in that Northwest Rochester neighborhood but now lives in suburban Greece. This summer is Jennings’ fourth with Green Visions. County officials agreed with Barry that Jennings is outstanding. She won Monroe County’s “Young Citizen of the Year Award” earlier in June. “I’m just incredibly proud of Tiani,” Barry said. 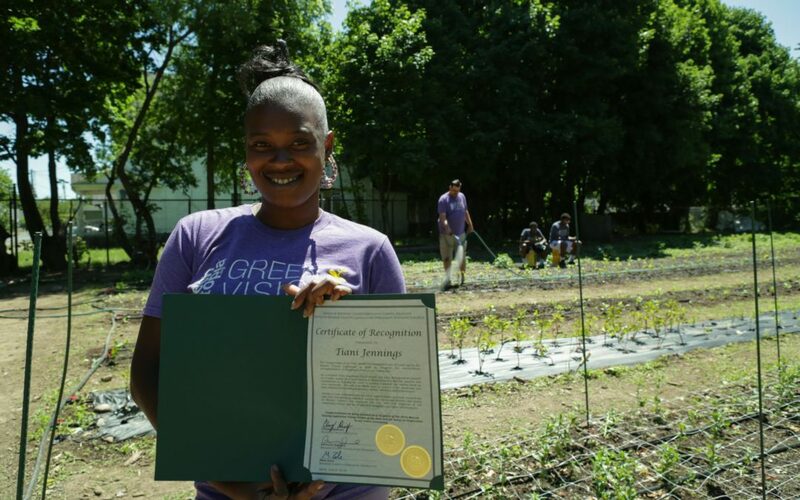 “Any recognition I can get shone on her is a great thing.” Her pay for 35 hours a week at the Green Visions gardens doesn’t go far enough to compensate her for all she does to guide and inspire other youth, Barry said. Jennings received the award from County Executive Cheryl DiNolfo at a special event. County legislators representing both JOSANA and Greece took part in the recognition. Jennings has been following two career paths for several years now. From April to October, when the Green Visions program is operating, she works in landscaping. “I’m a nature body. I love working outside,” she said. The rest of the year she works as a home health aide. She’s planning to attend college to get a license as a registered nurse, upgrading from homecare. Still, we can tell she’s pulled in two directions, as she says would also love to find full-time work in landscaping. “I love Green Visions. It’s like a piece of my heart,” she said.